I have a situation related to PO lines created with PO generator and manual lines entered using the purchase order entry where company and/or address info is not the same on all the PO lines. PO Generator is run and a list of PO's are created. If I add a PO line on a PO created with PO Generator, the Company Name (CMPNYNAM) field is blank. The PO Lines created with PO Generator has a Company Name in the (CMPNYNAM) field. Any idea why the lines added to a PO that was created with PO Generator have a blank Company Name? Does anyone know where the Company Name is supposed to come from for PO's entered manually? Now along came PO Generator. The creative developers added a x-reference table POP40800 to associate each SiteID with the CompanyAddresses Setups. For Standard POs created by PO Generator, the line address data comes from the CompanyAddress associated with the SiteID. CMPANYID is populated. Its enough to make your head hurt! 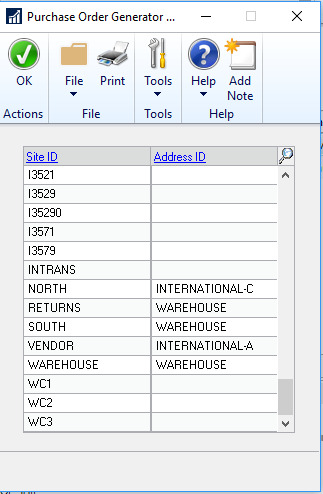 Oh and if you have not completed the POP40800 X-Reference table for Company Address to Site IDs, then the PO generator will default to the Primary Display Company Address data as the Ship To. Sometimes you gotta love the consistencies and standards.